Turquoise is a mineral usually found in association with copper deposits and is sometimes mined as a by-product of copper mining. The ancient mines of Meshed (Iran) are considered to be the best source of the finest turquoise. 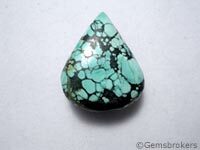 Turquoise just as fine is produced in Arizona and New Mexico. The most important turquoise producers are Iran, South West United States, Tibet, China, Afghanistan, Australia and Armenia.